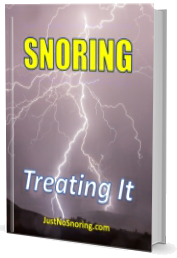 We have said before that snoring is related to stroke and heart disease. But the vibration also causes damage and inflammation to the throat and may be related to the thickening of carotid arteries, which increases the risk of atherosclerosis. The vibration can also be linked to chronic bronchitis. Additional information click here. Snoring affects the snorer with apnea, but also the partner. This is worse when the partner is a light sleeper. One solution is to have white noise, such a fan or air conditioner that masks variations in other sounds. Also, thick carpeting and heavy curtains can insulate the sound. Also, it is better to have a good attitude with the snorer. Additional details click here. Patients who had open heart bypass surgery have increased the risk of postoperative complications if suffering from obstructive sleep apnea. More info click here. Snoring affects the snorer by limiting the air passage but also affects the partner. One way to solve the problem it causes is not by treating the snorer, but by helping the preventing the partner from hearing the snoring sound. A company has designed a noise-canceling in-ear device, which will prevent the partner to hear snores and other low-frequency sounds. These sounds are difficult to block with earplugs, but the device does a good job. It also works with the low-frequency sound of an aircraft, making it easy to sleep on a plane. More info click here. This new treatment based on microscopic medical-grade salt can clear the airways, leading to better breathing and restores respiratory function. This helps with allergies, sleep apnea, smokers cough, and asthma, among others. Click here for more info. These amazing gadgets and products and will help you sleep. Among them are a fan that adjusts under the sheets, cooling you down, super soft bamboo bed sheets, eyeglasses that block the blue light from the smartphones, a humidifier, white sound generators, wake alarms that don’t sound, but mimics the sunrise, and ventilated pillows. Check the complete list. More here Additional details click here. Sleep apnea happens at night, while the person is not conscious. Snoring is one of the symptoms, but it’s not definitive. The article describes how a patient constantly felt increasing fatigue, exhaustion and headache when waking up, concluding that the reason was sleep apnea. Click here for more information. A comfortable mattress is fundamental for good sleep quality. It will allow to sleep quickly, with less tossing and turning. Lying down without getting any sleep will cause anxiety, which will prevent sleep. It must also provide good body support, especially on the spine and neck. Click here for more details. Sleeping pills are effective when used only for sleep disorders, and for a short time. However, some people use it for a longer time, when the pills wear off, resulting in more dependency on them. The side effects are heartburn, stomach pain, constipation, even amnesia, and dementia. Additional info click here. Weighted blankets are a new trend in improving sleep and anxiety. They can weight from 4 to 25 pounds, and the users say it gives the impression of a hug and a sense of security. According to a study, users with moderate insomnia report an improved sleep and fewer movements after two weeks of use. Anxiety sufferers also reported lower anxiety in more than half of the cases. These blankets offer deep pressure stimulation, which is a form of touch that seems like a firm hug or a massage. Research on deep pressure stimulation has found positive results in calming adults and children with autism, anxiety and attention difficulties. Additional information click here. Insomnia is the difficulty in sleeping at night, while sleep apnea is the interruption of breathing during sleep. These are the most common sleep disorders, and a study has found that these disorders frequently occur in the same person, calling it Complex Insomnia. Patients have a poor quality of life due to daytime sleepiness, fatigue, difficulty to focus and concentrate and irritability. Additional details click here. There is a new treatment available to stop snoring, which consists in applying a low-energy laser to heat and tighten the oral mucosa tissue. This boosts collagen production, tightening the air passage and preventing snoring and sleep apnea. Click here for more information. Researchers have found a correlation between snoring and a thinner skull. The thinning is up to 1.23 mm, however, a skull erosion of 1mm can cause a spontaneous cerebrospinal fluid leak (sCSF-L). This allows the liquid that serves as a cushion to the brain and spinal cord to flow away by the eroded area. The result can be life-threatening, including coma, stroke, and symptoms of dementia. This serious condition is also associated with obesity. The causes are not clear. The main symptom is a headache that gets more severe when upright and lying down. Other symptoms are neck pain, light or sound sensitivity, tinnitus, hearing changes, among others. More Information click here. Snoring in children can be a symptom of a serious health condition. Many of them have obstructive sleep apnea, which prevents the correct airflow to the lungs. This can be caused by enlarged adenoids and tonsils. It is also related to restless sleeping, sleepwalking and even wetting the bed after not wetting it for months. More Information click here. If your baby is snoring, there are many causes. One of them could be normal development, in which the soft tissues vibrate when the air passes through the airways. If the snoring persists as he grows, the cause can be allergies, or excess dust, among others. However, if it still persists, the cause can be an airway obstruction, such as enlarged tonsils, which result in sleep apnea. Other cause can be a deviated septum, in which one nostril allows less flow than the other. Click here for more info. Sleep apnea and snoring are related to bruxism, also known as teeth grinding. This is an involuntary jaw movement while sleeping and can be detected if the snorer wakes with a sensation of tightness on the jaw muscles. A study has shown that this is not only a problem for teeth, but also to dental implants, which break or deteriorate under constant grinding. Additional information click here. Technology can help to get better sleep. A smart pillow connects to an app and monitors the sleep, warns if you are snoring and even streams music through the pillow. Also, if your partner is a cover hog, a clap will prevent him or her from taking away the blanket. Click here for more info. Some people experience leg and foot cramps at night, which wakes them up in a painful way. However, doctors don’t have a clear idea of the causes. One research showed that stretching at night showed a decrease in the frequency of cramps. Others had positive results with magnesium and vitamin B supplements. However, specialists found out that patients with sleep apnea who begun treatment with CPAP machines reported that they had no more cramps. Even though the evidence is weak, cramps could be related to low oxygen levels in the blood. Additional information click here. Sleep apnea occurs when breathing is interrupted for a short period. This results in a reduction of oxygen in the blood, which leads to excess fatigue in the morning, and, if untreated, can result in high blood pressure, diabetes and even stroke. More Information click here. Sometimes we feel exhausted, affecting our concentration or our driving. The most obvious cause seems to be poor sleeping. However, there are other causes, such as excess weight, being underweight, because of a lack of muscle strength, or mental fatigue caused by stress or depression. There is a diet to boost energy: water will rehydrate the body, seaweed has iodine content, which helps with the thyroid function. Others are bananas, which are rich in potassium, and peanut butter, which contain magnesium. Check all the diet. More details click here. A new wearable device promises to stop the snores. It is a wristband that communicates with an app via Bluetooth. As soon as the wristband detects snoring sounds, it vibrates to prompt the wearer to change his position. Click here for more info. Proper sleeping habits begin by going to bed at a set time. This is more important for kids because it can affect their development and school performance. Daylight savings disrupt the sleep pattern, which is worse on the kids because they can’t change their sleep schedule as easily as adults, leading to sleep deprivation. Additional information click here.